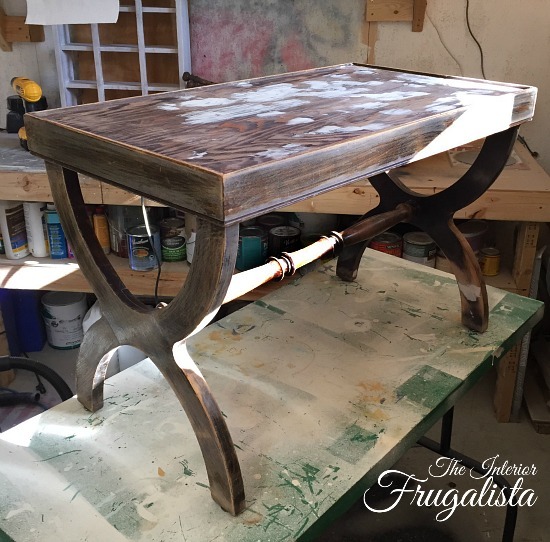 The coffee table I'm sharing today was going to be one of those quick and easy, done in a few hours kind of furniture makeovers. I should know better by now not to make that sort of proclamation. Most often these easy looking makeovers are the ones that end up being the most stubborn. 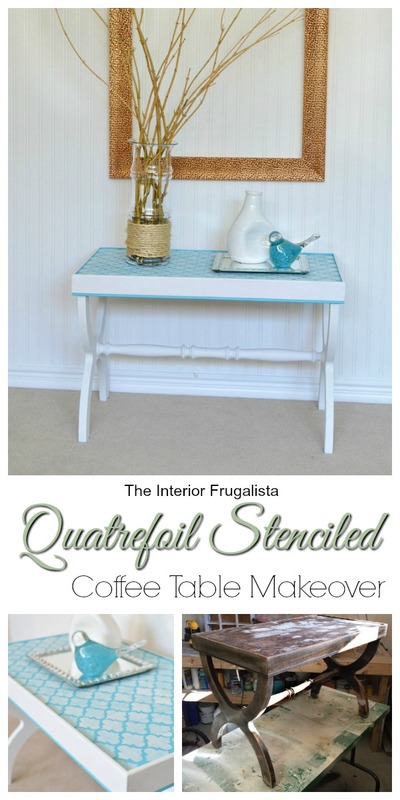 You're probably wondering why the heck I call it the Delightful Quatrefoil Stenciled Coffee Table Makeover then. More about that later. I got this and the very similar Black Old World Map Coffee Table, both with arched cross leg bases at a local online auction. Like the other, this table was also in rough shape. I was so eager to start this project that I forgot to take a picture before I patched the dents and scratches with Dynamic Dyna Patch, the only filler compound I use on furniture. 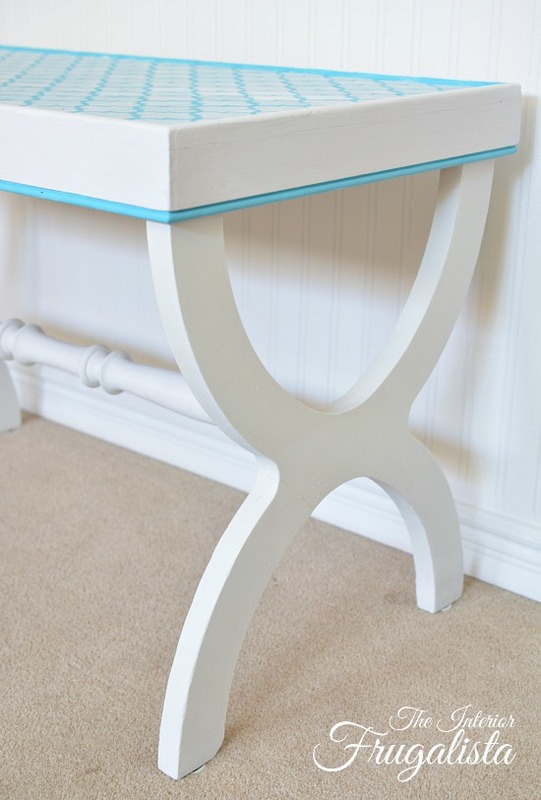 Once sanded to a smooth finish the entire table was painted in three coats of Simplicity White chalk paint from Country Chic Paint. Normally you get full coverage with just two coats but I was getting tannin bleed from the dark stained wood. I know better than not to apply a coat of shellac primer first but it was the weekend and I was being lazy. After the shellac dried I applied a third coat of white paint and that did the trick. In the wee hours of the morning during one of my many sleepless nights, I decided rather than counting sheep I may as well work on the table. 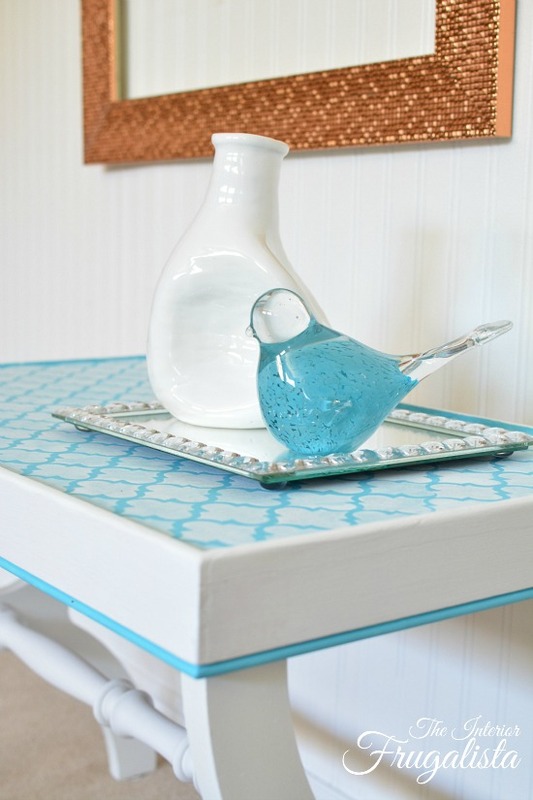 So I tip-toed down to the basement workshop to stencil the table top with a Moroccan Quatrefoil Pattern Stencil. Again, the plan was it would take only a few minutes and hopefully tire me out enough that I'd fall into blissful sleep afterward. Here is where the Delightful comes in. 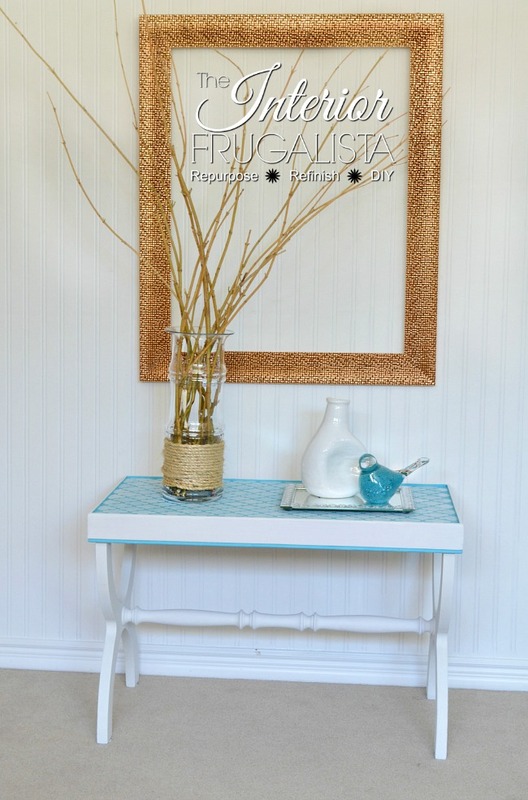 I stenciled the top with an aqua color chalk paint from Country Chic Paint called "delightful". 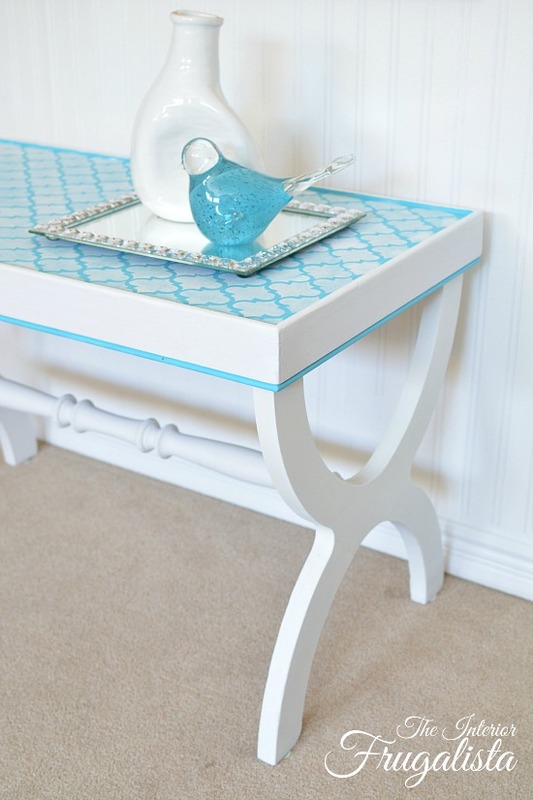 But let me assure you there was nothing delightful about stenciling this table. The first row stenciled without a hitch but somewhere between row two - an empty mug of coffee - and row three, Mama's eyes went a little wonky and I had one hot aqua mess on my hands. After a refill on that coffee (so much for the blissful sleep afterward) and a few deep breaths, I decided to repaint the top white and start again. That is now five coats of paint on the top. Second row - same thing. For the life of me, I couldn't figure out what went wrong when I was diligently following the pattern repeat on the stencil. I painted the entire top Aqua AGAIN, that's now a grand total of SEVEN coats of paint. This time I had success following the pattern repeat. 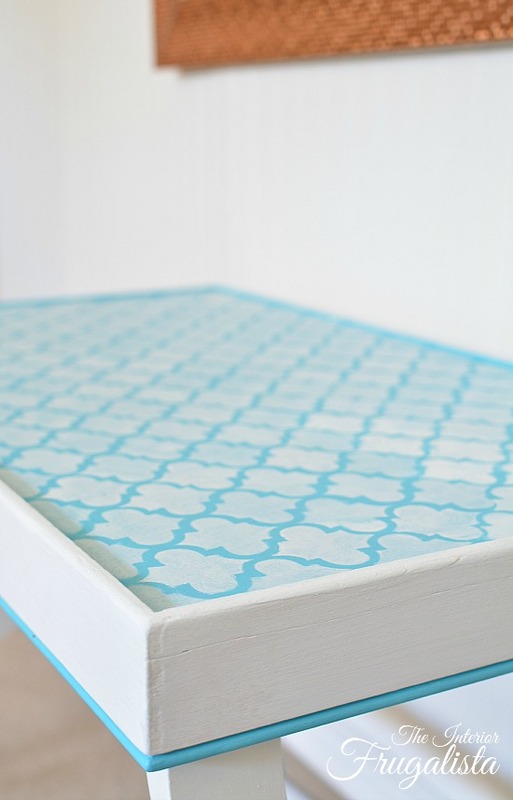 Stencil Tip: Stencil the pattern vertically rather than horizontally like my previous attempts. I must say, despite how frustrating it was to stencil the top it turned out to be a blessing in disguise. I much prefer the softness of the white over the aqua color. Using a small art brush I painted the detail around the base of the skirt in aqua for an added pop of color. 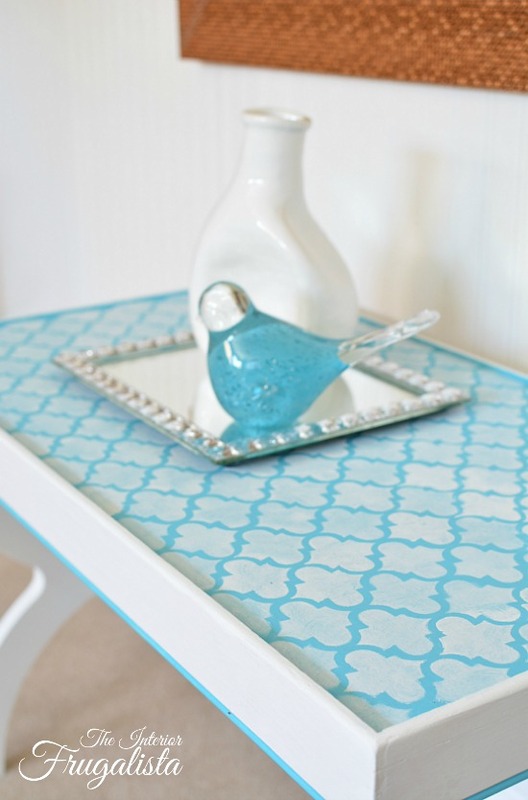 Now this Delightful Quatrefoil Stenciled Coffee Table with seven coats of paint needs a new home. Wouldn't it look great in bright sunroom? 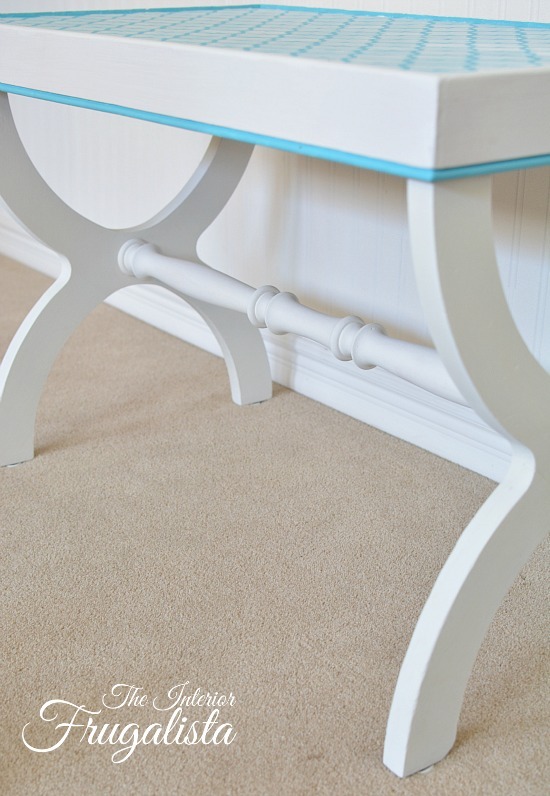 For more coffee table inspiration press HERE. If you found this makeover inspiring, please share it with a friend and/or save it on Pinterest. The lesson? When you decide to get up in the middle of a sleepless night to tackle a project that may require an alert mind. STOP, grab a book (one that isn't so riveting) and read yourself back to sleep. It'll go much easier and quicker after a good nights sleep. Have you ever starting painting in your pj's in the middle of the night? I'd love to hear about it in the comment section below. If you did it while sleepwalking, then I REALLY want to hear about it in the comment section below.